Professor Wolfs received his BS and MS in physics from the University of Groningen (The Netherlands) in 1981 and 1983, respectively. He received his PhD in physics in 1987 from the University of Chicago. He was a postdoctoral associate at Argonne National Laboratory between 1987 and 1988. Between 1988 and 1990, he was an Enrico Fermi Fellow at Argonne National Laboratory. 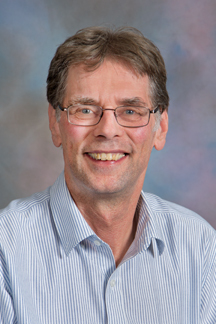 Professor Wolfs joined the University as an Assistant Professor of Physics in 1990, was promoted to Associate Professor in 1996, and to Professor in 2000. Wolfs received the University of Rochester Goergen Award for Distinguished Achievement and Artistry in Undergraduate Teaching (1997), and the Curtis Award for Nontenured Faculty Teaching Excellence (1995). Professor Wolfs' research interests are primarily focused on the area of high-energy nuclear physics and particle astrophysics. In 1995, Wolfs joined the PHOBOS collaboration and started to focus on the study of relativistic heavy-ion interactions, using heavy-ion beams from the Relativistic Heavy-Ion Collider accelerator at Brookhaven National Laboratory. The goal of the work at Brookhaven National Laboratory was to create a new form of matter, the so called Quark Gluon Plasma, which excisted a few micro seconds after the Big Bang. The study of the properties of the Quark Gluon Plasma provides not only important information on deconfinement, which can be used to test the predictions made by Quantum Chromo Dynamics (QCD), but also can be used to address the evolution of the very early universe. The experimental program of PHOBOS was terminated in 2005, after all the objectives of the program had been met. In 2005, Wolfs joined the Zeplin II collaboration to search for dark matter using a 31-kg two-phase liquid xenon detector, installed in the Boulby mine in England. In 2007, after publication of the first result obtained from the data collected during the 2006 physics run, the Zeplin II collaboration concluded that further operation of Zeplin II could not be justified. In 2006, Wolfs and researchers from several other US institutions, formed the Large Underground Xenon (LUX) collaboration to design the next generation of dark-matter detector, based on two-phase liquid xenon, to be installed at the DUSEL early-implementation site in the Davis Cavern (4850 ft). The detector will be installed in the Davis Cavern in 2009, and physics operation will start in the second half of 2009. Wolfs is responsible for the trigger system, which is based on the DDC-8DSP digital signal processor, developed at Rochester. For further details, go to Professor Wolfs' home page at: http://teacher.pas.rochester.edu/. Edwards, B., et al., Measurement of single electron emission in two-phase xenon, Submitted for publication (2007). Bisset, R., et al., R&D for Future Zeplin, Nucl. Phys. Proc. Suppl. 173, 164 (2007). Alner, G.J., et al., Limits on spin-dependent WIMP-nucleon cross-sections from the first ZEPLIN-II data. Phys. Lett. B. 653, 161 (2007). Alner, G.J., et al., First limits on WIMP nuclear recoil signals in ZEPLIN-II: A two-phase xenon detector for dark matter detection. Astroparticle Physics 28, 287 (2007). Akimov, D.Y., et al., The ZEPLIN-III dark matter detector: Instrument design, manufacture and commissioning. Astropart. Phys. 27, 46 (2007).